Oh Koro-sensei, He wasn't just teaching his students new things, he taught us fans new things too, even if we didn't realize it. Among-st the many things Koro-Sensei taught us, was how to laugh, learn & develop, always make room to improve, be inspired, challenge yourself, and most importantly use your full potential! During the shows first season I was not interested in the anime nor manga. I felt that the story was absolutely ridiculous and a complete waste of time reading/watching. It wasn't until 2013 that I saw "Funny moments" or "best moments" in anime videos on Youtube and saw Assassination classroom on it and thought to myself, "ha, this does look pretty funny" "I'll try any show once", gave it a watch and was for the most part blown away.. like the moon... (Puns intended. )My favorite thing about the story and plot is that it connected to me, the viewer on a personal level. I could relate to how most of the characters backstories in E classroom were treated at school. For the most part, mainly towards the ending of the season 2 I felt that the build up towards the final episode were very well executed... or should I say.. assassinated.. wait, I don't think that word works.. whatever. The begining of the season 2 has ups and downs however for the most part, it remains pretty solid. I don't want to use the term "roller-coaster" but I think I will use that to describe it. For example, 1-4 episodes will be about the daily lives of certain students, or the students working on something unrelated to the story. It felt more like filler episodes for the most part. Now for the second part season 2 the backstories about certain characters past and the history of class E finally begin to unfold. We are introduced to more characters and both shocking, and sudden plot developments, as to be expected. For the most part each arc of season 2 is all over the place and honesty, I felt it lacked a sensible amount of balance. The plot for certain episodes can feel a bit confusing at times because one second the students are honing their skills then next episode they are helping re-build a shelter. So balance does seem to be a reoccurring problem within the story-line. Overall I l was generally impressed with the story, I believe that Yūsei Matsui did an amazing job with his work and that Lerche did an amazing job following the work. Number one thing that annoyed me about the series overall is that the animation or lighting in Ansatsu Kyoushitsu, even without the show being censored it's really dark. There are multiple moments in the show where areas are unnecessarily darkened to the point where I actually start questioning myself "This is the uncensored or raw version right?" The background settings looked poorly done so maybe that's why the animators decided to use darkness in multiple scenes. Character designs still remain the same so I do not have much to add to the subject. I felt like the artwork, especially the background settings needed to be re-done. I hope to see whoever is in charge of editing the Blu-Ray discs, brightens things up. Fuchigami was able to enunciate or pronounce English better. Everyone else did a great job with their roles and I think that Ansatsu Kyoushi has one of the best cast of voice actors for an anime series. Each of the actors are able to express a good amount of feeling with their characters in order to make their characters feel more... realistic. The characters are the most vital part of Ansatsu Kyoushitsu. The main focus for all characters in Ansatsu Kyoushitsu is growth & development. These two things are literally the key in what makes this series work out so great. As to be expected of course, during the beginning of the series season 1 until the ending, the characters are lacking strength, potential, and skill. My favorite thing about the series characters is that I felt like I got to experience growth along with the students, and the teachers in this series. The way the characters react when they learn new things or acquire a new skill, because I felt so involved while watching it made me feel like I learned something new too. For example, if Koro-sensei is speaking directly to the students about studying for an exam and he's giving them both words of advice and encouragement then I, the viewer am also receiving some sort of acknowledgement too. Another thing about the characters is that they're all made to be either relate-able and or likable. That way viewers like me feel like they are on the same level as the characters in the show. Out of all departments listed from the "rate the anime" category I would say that characters are my most favorite thing about the series. Enjoyment and pleasure is always experienced while I'm watching Ansatsu Kyoushitsu. I don't think for a second I've ever been truly unsatisfied with an episode. I have to give the series some praise because for 25 episodes and not a single one for me to dislike, I think that's amazing. I think to myself, even while writing this, "hmmm, I know there has to be at least one episode I hate" but I just cannot think of a single episode. Overall I was very satisfied with Ansatsu Kyoushitsu. I think although it may not have been the best of the current season it still stood out enough to earn the 4th spot in my top 5 airing the spring season. 9/10 for a memorable and joyful experience. The sad fact of life is that all good things must eventually come to an end, and that includes whatever school year might have actually been fun for you. Thus, Class 3-E - the only class that teaches assassination - must come to an end, as well, whether the world goes down with it or not. In this season of Assassination Classroom, we get to see how it all ends, making it one of those anime that is actually a full adaptation of the original manga. When I watched the first season last year, I enjoyed it a whole lot; that was more than enough to get me to watch the second season when it came out. Needless to say, this season was even better. 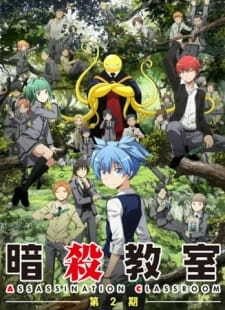 Ladies and gentlemen, tentacles all over (yes, I'm saying that again), here is my review of Assassination Classroom Second/Final Season. For those unfamiliar with Assassination Classroom, it centers around Class 3-E, which is considered to be the lowest class in Kunugigaoka Junior High (and gets poor treatment from both teachers and students because of it). They end up getting a new teacher, which is a huge, yellow, octopus-like thing capable of Mach 20 speed and, as it is said, mass destruction; you see, he is apparently responsible for the recent destruction of the moon. He claims to be destroying Earth next in a year, but first, he wants to teach Class 3-E. Thus, Class 3-E is given the assignment of killing this thing, now named Koro-sensei, by graduation, and they will earn the 10 billion yen bounty on his head if he does so. Needless to say, Koro-sensei proves to be an excellent teacher to the students by not only teaching them the regular school subjects and assassination, but also life lessons. The second season of Assassination Classroom picks up from where it left off, and boy, does it get great from there! A few parts of the story in this season feel a little rushed, but it was certainly never boring! It provided a lot of character development for each character in this series, even some of the ones that started out unlikable. For example, the principal of Kunugigaoka Junior High, Asano, starts off as someone with a heart of stone, but when you get to see his backstory, you start to sympathize with him even a little bit. Speaking of backstories, Koro-sensei's backstory is finally revealed in this season, as well, and while trying not to give too much away.... man, is it intense! The art and animation in season two of AssClass (still amused by this abbreviation) is pretty much the same as in season one, seeing that it's still Lerche animating it, so there really isn't much for me to say here. It's still well-done animation that especially stands out in the easy-to-get-into action scenes. The Japanese voice acting for this season is pretty good, too. Now, as for the music, I honestly thought that both the opening and ending themes of this season left more of an impact than the opening and ending themes of the first. I especially liked "Bye-Bye Yesterday", the second opening theme; it's really sad that this anime is ending, and this opening really made me feel the impact of its upcoming end. Overall, while I did enjoy season one of Assassination Classroom, season two was even better. If anyone has seen season one and wants to know how it ends, you'd better watch this. I'm personally looking forward to seeing more of these interesting characters in the spin-off, Koro-sensei Q, but for now, we must say goodbye as Class 3-E graduates from their assassination classroom. In some cases, plot armor works to help the anime. Ansatsu Kyoushitsu is one of these rare examples. Sure, we know what's going to happen. Sure, it's the greatest moment when the entire show builds to it's climax and then it explodes into a colorful rainbow of nostalgia and emotion. But it can't wash away all the screw ups of the show in the past, right? Thankfully, Ansatsu Kyoushitsu rarely screws up, but even if it had, most of it would have been forgotten with the climax to top all climaxes. Ansatsu gets most of it's praise from how unique it is, and I won't argue with that. It's a very strange concept that almost makes you forget it's a shonen at points. ALMOST. Being a shonen isn't necessarily a bad thing, though. It just means that it's prone to the flaws of shonen - arcs that are inferior to others. Again, Ansatsu pretty much blows that out of the water though. None of the arcs are inferior to others, which I feel even works against it at a point, when the final arc was just as exhilarating as one from the halfway point. And, most of the arcs follow a common pattern in shonen - bad guy shows up, minor struggle, you beat him, the next bad guy shows up, slightly larger struggle, you beat him, boss shows up, big struggle, you beat him, recovery episode. Which brings me to the ending. From the very beginning, straight out of episode one, you had been waiting for the death of Koro-sensei. The moment was just as filled with sadness as everyone had predicted, it wasn't surprising at all. But looking in the episode discussion, you don't find anybody complaining, even the manga readers were impressed with how well it was handled. In conclusion, Ansatsu is creative, but not quite groundbreaking. Lerche isn't a very famous studio, and even if you had heard of them before, it probably wasn't for their mind boggling animation and more likely for their screw up of Daganronpa. When the original season first aired the animation was still pretty mediocre, but it hasn't improved since then, and the animation around it has, which has made it even more underwhelming. Both the art and animation are bad. The first opening theme screams average to me. It sounds like I've heard it before, kind of thing. The endings are slightly better but still, 99% of people won't care to remember or even listen. But every once and a while, there is an theme song that completely outclasses the rest, the one people remember the show for. Bye Bye Yesterday is one of the three openings I've listened to so many times in a row I got tired of it. Usually it's one or two, but with this one it was probably 20 - 30. That's insane. Actually, I'm amazed I was able to, writing that down. It may seem unbelievable, but it was THAT good to me. The soundtrack gets completely ignored because most of the openings aren't spectacular, which is such a shame because the innovative soundtrack is one of the show's best features. Some of it feels a little out of place, like it should be in a mystery show, but it's still great nonetheless. The average sound effects are made up for by the highly praised seiyuu that voice the characters. Koro-sensei and Karma, in particular, are voices that I could put to the face blindfolded. Ansatsu has it's ups and downs in the sound department. Really, Koro-sensei is the only character that I felt was good. He works really well as the series mascot, but if that wasn't enough, he was also hard not to love. Despite this, I can see why others consider him to be annoying. The other main character, Nagisa, is pretty average for a main character. Acts-weak-but-is-actually-the-best-in-the-class kind of thing. As for the supporting cast... well, this is why Ansatsu is so praised. All of them get their own little development arc, which seemed forced to me. On top of that, the characters really are just templates, design and personality-wise. Just because the show does a good job at featuring them all doesn't necessarily make them good characters. Ansatsu Kyoushitsu is definitely show that was meant to for you to not expect anything at all, and then take the viewer by surprise. Did it take you by surprise? Or did you like it anyway? Feel free to comment on my profile and tell me what I did wrong with this review, I'm always up for feedback. Thanks for reading! After finishing the first season, I started to question the direction of the story. It had its moments and the comedy was fairly good, but I wasn’t overall very impressed with it. The assassination premise is presented in a colourful and fun manner that it tends to take lightly of its consequences. It glorifies that assassination serves as a way for fellow assassins to create bonds and promote self-improvement. I can’t help but see it as a flaw, given that I’m already used to seinen titles that explore the world of assassination in detail and it’s definitely not all fun and games. The dynamic between Class E and Koro-sensei is great but the latter still remains a mystery. Little is known about his background and motives. They are all complaints I had but things start to get more interesting as the second season started rolling in. The main theme of the second season is graduation. We all know that feeling, sharing fun moments with your fellow classmates inside the classroom. But, you know that they will all come to an end in the inevitable future. Fitting that into the pre-established setting, it unexpectedly works well. Who would have thought that the show can manage to promote that sense of sentimentality despite its assassination theme as each characters reflect on how they have progressed so far. Assassination is taken more seriously now, since it starts to slowly sink in that they will have to kill Koro-sensei eventually and that time is running out, making it an interesting conflict of emotions. Questions are posed such as “What does it really mean to kill?” and “Is there any other way around it?” The fun approach towards it is still there, but it’s toned down a bit. The story goes full-force with the sentimentalities of graduation but it tends to breeze past its pre-existing issues such as the education system and the involvement of the government and other external agencies in relation to killing Koro-sensei. It’s a shame that they were never really tackled and explored well while certain episodes are wasted on school activities that has little to do with the ongoing story. It does enhance the reoccurring theme but they feel out of place. The show starts to unfold Koro-sensei’s past and makes his motives clear to everyone which is a good thing since that was what often bugs me while watching the previous season. The character development among the cast is starting to be more apparent. The gravity of the situation is starting to get into them and we get to see how they plan to cope up with it even if the situation is over. It’s like being anxious not being to be able to graduate, and the only way for that to happen is to pass the final exam. That final exam is Koro-sensei. He has been with the cast from the start. Despite being an assassination target, everyone becomes attached to him in a way. This further adds up to the sentimentality. Overall, if you found the previous season somewhat lacking, then this sequel will somewhat remedies that. It doesn’t resolve every single issue, but it manages to conclude the main story well that leaves you quite the emotional impact.